BLACK FRIDAY: AMERICA’S MOST REVERED EXPORT? Local retailers are gearing up for one of the year’s busiest weekends as Black Friday sales lure shoppers with unmissable discounts. This year’s Black Friday, however, is unlikely to change weak retail trade sales growth, which moderated to a lacklustre 0.7% year-on-year in September, from 2.5% in August, affirming the economy’s muted consumption demand. The sector, which accounts for about 60% of GDP, will indicate whether South Africa is on track to hobble out of a recession in the second half of the year as September’s mining production declined 1.8% year-on-year and manufacturing remained stagnant at 0.1%. Despite South Africa’s muted growth, the retail space continues to grow in one area, namely e-commerce. The recent Online Retail in South Africa 2019 study by World Wide Worx shows that online retail continues to grow at a high rate, having maintained a growth rate well above 20% since the turn of the century, lifted by the exponential adoption of smartphones. Taking 2017 as a base, South African shoppers have showed an affinity towards Black Friday. Data shows that television unit sales were up 47%, with smartphone sales spiking by 63% during the week of Black Friday 2017 in contrast to the same week in 2016. Despite technical goods’ popularity, pricing remains the most attractive feature of Black Friday shopping sprees. and wage increases on the meagre side, retailers will need to think carefully about how to bag consumers’ disposable income. 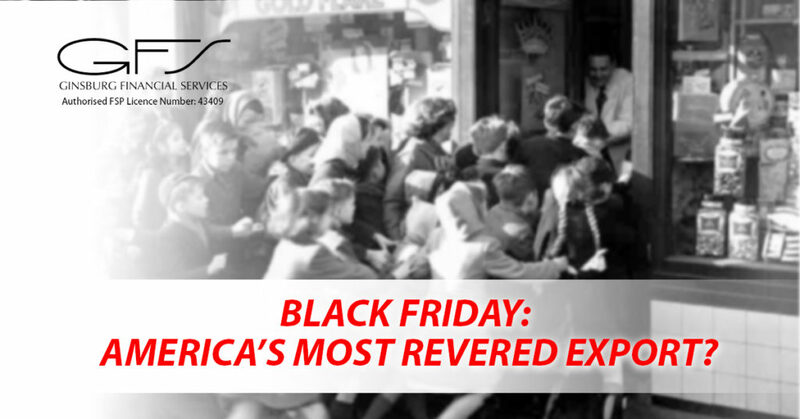 Contrary to popular belief, the first recorded use of the term “Black Friday” was not in any way related to binge shopping the day after Thanksgiving in the US. Black Friday dates back to a crash of the US gold market on September 24, 1869, when Jay Gould and Jim Fisk infamously bought as much gold as they could hoping to drive up the market price and sell it for astounding profits. As gold soared to $162 an ounce, the first ‘Black Friday’ was born. Its ‘shopping’ identity emerged in Philadelphia during the 1950s, with police using the term to describe the chaos of the day after Thanksgiving when shoppers swamped the city ahead of the big Army-Navy football game held every Thanksgiving weekend. The holiday presented the ultimate opportunity for brick-and-mortar stores to clear stock, and the concept took hold. Philip Morris International Inc. will open a flagship store in Johannesburg as it tries to stoke demand in Africa for its alternative cigarette known as IQOS, which heats rather than burns tobacco to give smokers their nicotine kick. The Marlboro maker plans to use the shop as a springboard to expand in the rest of the continent. South Africa is the only African country in which Philip Morris distributes IQOS, but more are slated to follow. Philip Morris has 70 IQOS shops in 23 countries, echoing a wider trend of tobacco companies including British American Tobacco Plc and Japan Tobacco Inc. investing in smoking alternatives to drive new revenue streams. Traditional cigarettes are under pressure from regulators across the world and have declined in popularity as more people become aware of the inherent health risks. South Africa has seven million smokers, which is about an eighth of the population, according to a report by the Foundation for a Smoke-Free World. A South African footprint will help Philip Morris build the case for IQOS with regulators and consumers in other markets in the region. The company estimates about 10 000 smokers are converting to the device daily and is still awaiting approval from the Food and Drug Administration to sell them in the US.